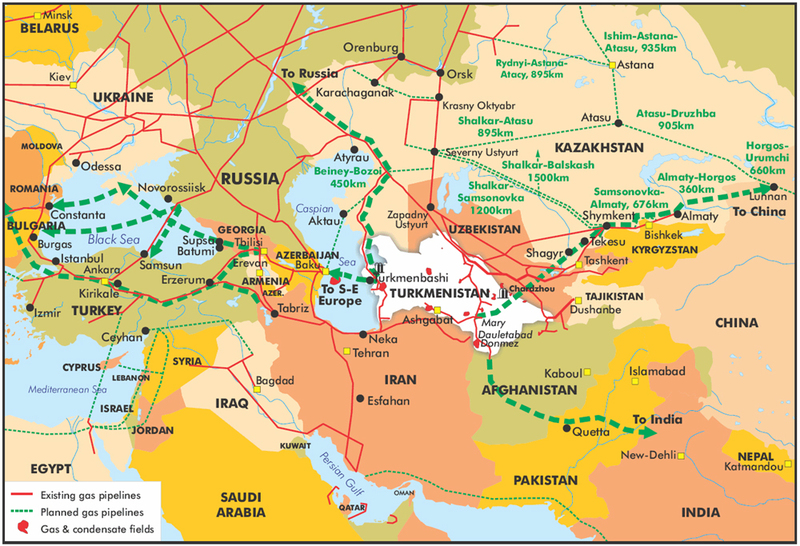 Turkmenistan holds the world’s fourth largest gas reserves; from the Galkynysh Field huge black pipes thread their way east across the vast searing deserts of the country, going on to power Chinese homes and factories. Just like railways, the construction and direction of pipelines tell us a lot about geo-political power. Central Asia is the scene of a struggle for influence and resources between rising powers, primarily China, Russia and Turkey. Thanks to their history as part of the Soviet Union, the Central Asian ‘Stans have remained well within Moscow’s orbit, but now the situation is more fluid and their paths are diverging, as some states look to China and beyond for new friends. Turkmenistan remains the most paranoid and secretive state in the region, with phone taps and heavy surveillance the norm thanks to a powerful internal security apparatus retained from the Soviet era. Chinese demand for gas has led to the development of the pipeline from the country; which has meant President Gurbanguly becoming a regular in Beijing and aligning Ashgabat’s interests in that direction. Another pipeline has recently opened going south to Iran, demonstrating that Tehran is also player in the region, and its influence not just limited to neighbours and fellow Farsi speakers in Tajikistan. Tajikistan is the poorest of the Stans and is trying to build the massive Rogun dam in order to become energy self-sufficient. Chinese financial firepower would make them most likely candidate to fund the dam, but it looks in this case to be the Russians that will part pay for it, perhaps an assertion of their power and influence in the country. Moscow is also planning an Eurasian Union trade zone encompassing the region, and with so many Tajiks working in Russia and sending home remittances to their families, it is vital for them to be a member. One person not happy about the construction of the Rogun Dam is Islam Karimov, ruler of Uzbekistan, perhaps the most notorious despot in the region thanks to stories of his security services boiling enemies alive and the entrepreneurial activities of his daughter Gulnara, who has made a fortune “taking over” choice local businesses as well as finding time for a pop career and a jewellery business. Karimov accuses his neighbour of stealing water through the construction of the dam, a precious resource in dry Central Asia. Karimov has steered a rocky path of relations between the major powers, hosting a US military base before ending the agreement in 2005, while this pleased the Russians at time, they changed their mind pretty quickly when the Uzbeks declared neutrality and left the ODKB, a local military alliance, headed by Moscow. Kazakhstan is the giant of the region, it remains broadly allied with Russia and is set to join its Eurasian Union, but economic ties to China cannot be ignored, the world’s biggest energy consumer on its doorstep. Hydrocarbons are sent via newly built pipelines and cheap consumer goods are purchased in return. However it is unlikely that Beijing will push to overtly extend its influence in Kazakhstan or the region at large, as this would alienate Russia, and China probably views maintaining good relations with its giant neighbour and energy supplier as more critical than dominance of Central Asia . But this scenario also demonstrates Russian weakness. China has interests across the globe, its concerns in Africa, South East Asia and Japan are all more important, but for Russia, Central Asia (and the Ukraine) are its core interests. Turkey promised to become a major player during the 1990s but never really lived up to its promise, now its foreign policy ambitions lie more towards the old Ottoman Empire region rather than Central Asia, nonetheless it will remain a country to watch. To the south energy poor India and Pakistan look to influence Afghanistan and perhaps one day oil and gas rich Central Asia. Great post, There is a fantastic book about that, The new great game by Lutz Kleveman. Thanks ! Finally got round to reading it – a really interesting book, I will cover more on this topic in the future.